The Resurrection of Jesus is a fact in itself, but for the disciples the experiences of the Resurrection are different and varied. Each of them experienced it in his or her own way and at their own pace. And the running of Peter and John to the empty tomb is very symbolic of that. John ran faster than Peter and got there ahead of him but each of them came to the experience of Jesus in their own time and at their own pace. Resurrection can be a very difficult reality to comprehend or to make a connection with. I find myself when I’m going through Holy Week that I have a very strong connection with Holy Thursday, Good Friday and the early part of Holy Saturday – these touch something very deep inside the heart. Resurrection is a very different thing because we haven’t yet experienced it ourselves. But what I do believe is important is the intensity of desire that is in our hearts to have the experience of Jesus risen from the dead and that we go on and persist in our intensity. 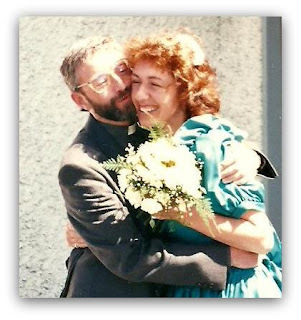 For me, the best parable or experience of it in my own life comes from when my sister Maura died suddenly 18 years ago at the age of 46. Maura and I were very, very close; we were always together and there was a very strong physical connection between us as well as emotional. So, when she died I felt intensely lonely – we all did – and I used to say to God in prayer how much I missed her and how intense was my desire to touch her again, to feel the touch of her presence in my life. A prayer that went on and on relentlessly for maybe a year or two, a prayer filled with sincerity, desire and sorrow. Then I had two dreams, one of which I have spoken and written of before. The second one is in my mind today. In the dream, I went to the cemetery to visit her grave and as I was going through the gates the cemetery was transformed into a church where Maura was sitting alone in the back seat. She held out her hand to me and said, “will we dance?” And I said, “we can’t dance here!” And she replied, “we can!” Throughout our lives from the time we were teenagers we loved to jive and became very good at it. So, she took me by the hand and led me to an open space at the top of the church. There was no music but there was light, this beautiful light shining down, not a physical electric light but it was like the light of heaven shining down upon the two of us. And there we danced bathed in the light; we danced to, what I call, silent music. Silent but joyful! When I woke from that dream what struck me was – that I would go to the cemetery looking for my sister and it’s like what the Lord says in the gospel of the resurrection, “why search among the dead for someone who is alive?” Maura was telling me, God was telling me through her that even though she had died and was gone from me that she was in fact alive; telling me that that life is the life of Jesus, a life that is contained within the embrace of the sanctuary of the church where Jesus is present and alive in the Eucharist. The promise of that dream is also that I myself one day, that all of us will enter into the sacred space of Jesus in the Eucharist in its most perfect sense, that we will enter into the light of that experience and we will dance in whatever way we are able to dance. One of the lovely things about the spiritual life is that there is song and there is dance in it but you don’t have to be a singer or a dancer to engage in it. Because every move we make in the presence of the Lord and every song we sing is beautiful to Him, for He loves the voice that is in you, the voice that He given to you – it is music to His ears. The very sight of you, the way you move is a joy to Him. 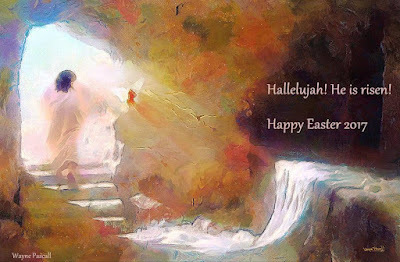 So, if we are to live Easter today it is to live it with joy and hope; to live it in the embrace of the light that shines upon us, especially from the Eucharist, the light of heaven. And even if grief is present and intense we will know that we are bathed in that light, that we are held in an embrace that is tender and infinitely loving, a light that will lead us all to the fulfilment and the perfection of life that we desire.